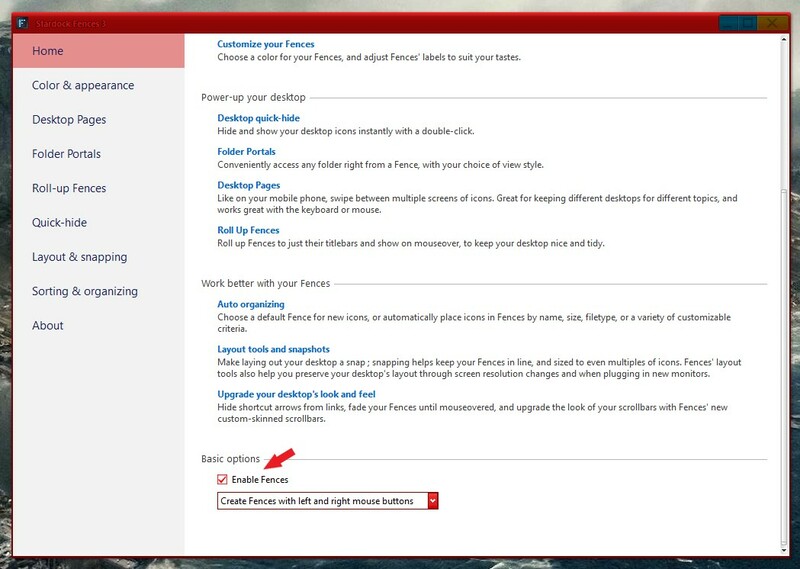 Yes I use Display Fusion and have Nvidia Nview installed but never use it. I can see all my desktop shortcuts in File Explorer but they don't show on my desktop any more. No other problems at all. Correct me on this: the only fix is to make a backup of current snapshots, purge Fences, and then restore an old fence pre problem? Sorry to hear you are having issues. Few question. 1) What happened to your desktop when you disable Fences (untick)? 2) You mentioned disable pages. You mean you disable this? If yes, once disable all the fences did not returned? Should have mentioned: all 4 monitors are identica 4k 27 inch Dells Ultrasharp. Monitor Display Arrangement is 3/4cloned and extended to 1 and 2. All set to same resolution. Size is 175% Video card is Nvidia QuardroP4000 upto date driver. 1. When I disabled Fences all the icons and shortcuts and folders that File Explorer shows in my desktop folder do display on the Fesktop. 3. After my post of last night, I re-enabled Fences. Then I've restored a 10 day old snapshot. Then I copied and pasted most but not all of the missing icons/shortcuts/folders to the Fences enabled monitor display. I moved them into fences. Now the problem is that what seems to be only one Fence which I recreated in my step 3 (before disabling Pages) above using File Explorer was fine for a while and then disappeared. I could find it off my main screen and drag back but now has disappeared without a trace. 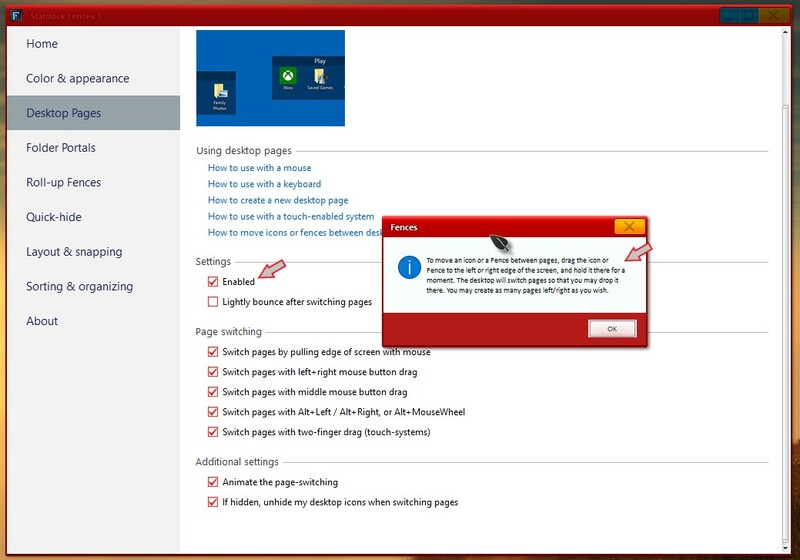 Disabling Pages doesn't bring it back. Yes I do see the icons/shortcuts for those two (as well as others that i did not manually copy and past back to Fences via File Explorer) when i disable Fences. Nothing special about those two icons/shortcuts that I can tell. One points to a local app for Stamps.com and the to the Stamps.com website app. 4. Separate Question: Is there any way to predict where a newly added or installed icon will appear before I move the icon/shortcut to a specific fence? They seem to default to a fence on the right hand side of my main monitor. Just after I posted the above, I moved some of my fences off the primary cloned monitor to extended monitor no. 1. Voila the missing fence for stamps.com reappeared on the primary monitor. I guess there's no warning when you have too many fences on a single monitor in this situation. That still leaves the other icons that I'll have to manually paste on the Fences desktop. Question: is there a reg key setting to increase the number of daily snapshots to more than 3? I have exactly the same problem. Anyone got a suggestion? My suggestion, please post a video grab of the problem so we can understand the problem more clearly. Make sure to re-download the latest installer from you account. Install it and reboot. Retest it and see if it helps. AngelS, fix for me was to move some of my fences to one of the other extended desktop monitors. After doing that, the missing fences appeared on the first screen. Been stable ever since. Turn off autohide when double clicking. That was way too slow to be of any use. Question: is there a reg key setting to increase the number of saved daily snapshots to more than 3?